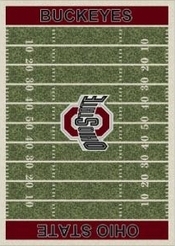 now this rug is the coolest perfect for a good old fashion knee football game!!! This rug also is a 100% stainmaster nylon carpet!!! includes free shipping this is the best price on the internet!!!!! !